The most talked about technology of the new year may very well be 4K video, the next evolution in HD television picture quality. But don’t take my word for it, take Google’s. GigaOM is reporting that YouTube will be demonstrating its own 4K streaming video technology at the 2014 Consumer Electronics Show next week. 4K video – shorthand for ultra HD content streamed with about 4 times the resolution of current 1080p TVs – is still a technology in its infancy. Like with the early VHS vs. beta wars, companies are today battling over 4K streaming file standards. Google is hoping its royalty-free VP9 format wins the day. The big bonus behind Google’s VP9 tech is that it helps reduce the amount of data needed to deliver vivid 4K ultra HD graphics. Google tells GigaOM that VP9 will also cut the amount of data used by regular HD video streams by half. There's no telling whether Google's format will win the battle, but most major players in the industry have already agreed to support the technology in their products. 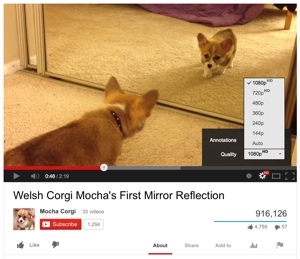 In short, YouTube will soon be available in a higher resolution, and content will stream to you quicker. Google's VP9 technology should be available in consumer electronics by the end of the year. We’ll have more on Google and on 4K television technology in general with our coming coverage of the Consumer Electronics Show next week.